When I was about 8 years old, my mom wanted me to go to kids church meetings during the week, I think on Tuesday after school. She worked way back then (in the 50's) and she arranged for me to ride to these meetings with a neighbor lady(and several other kids). This lady drove a Hudson sedan (Commodore?) with the step down interior. It was the only way she could get me to go to church. 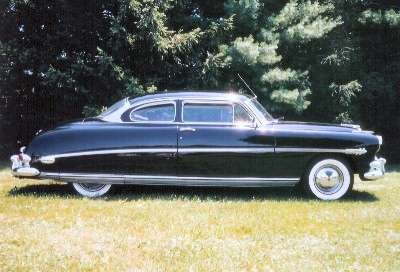 The Hudson Hornet was the hot car to beat on the stock car racing circuits in the early 50's. A beautiful car, way ahead of its time. The Hudson was a great car. Called a step-down design where the floor pan was mounted well below the door sill. The rear window distorted the image in the rearview mirror. Cars behind looked wide and squat. Immortalized in the Pixar movie "Cars". Paul Newman provided the voice for Doc Hudson, a 1951 Hudson Hornet who was also a retired race car.